September 16, 2013 – Links International Journal of Socialist Renewal -- On September 11, Catalonia’s national day (the Diada), around 1.6 million Catalans linked arms to form the Via Catalana (Catalan Way), a 400-kilometre human chain demanding a referendum on independence for the country. Catalonia has been a region of the Spanish state since September 11, 1714, when its besieged capital Barcelona finally fell to the Borbon coalition of France and Spain, ending the War of the Spanish Succession. The amazing success of Via Catalana, organised by the Catalan National Assembly (ANC) and inspired by the human chain that in 1989 demanded the independence of Estonia, Latvia and Lithuania from the former Soviet Union, has already driven the right-nationalist Catalan minority government of Convergence and Union (CiU) to speed up plans to fix an exact date and question for a referendum in 2014. On September 12, the CiU administration announced that it was confirming its agreement with the centre-left nationalist Republican Left of Catalonia (ERC) for these two issues to be settled before the end of the year. CiU relies on ERC support to stay in government. The core of the agreement between the parties is precisely CiU’s commitment to hold an independence consultation before the end of the three hundredth anniversary of the fall of Barcelona. Catalan premier Artur Mas’s plan B—to hold no consultation if it cannot be agreed with the national People’s Party (PP) government of Prime Minister Mariano Rajoy and to replace it with a “plebiscitary” Catalan election in 2016—has had to be shelved for the time being. The reason is the strength of feeling in Catalonia for a consultation in 2014, a year in which the Scottish independence referendum will also be held. The Via Catalana also disconcerted the centralist forces ruling the Spanish state. Within the national PP government, the foreign minister José Manuel García-Margallo acknowledged the “success of the organisation, logistics and communication” of the human chain, even as deputy PM Soraya Saenz de Santamaría was reduced to the hand-me-down of conservative politicians faced with mass protest: What about the “silent majority” who had stayed at home on the day? By September 14, however, the national government’s official line became known with the publication of Rajoy’s long-awaited reply to a July letter from Mas asking for Madrid to approve an independence consultation in Catalonia. Rajoy’s letter carefully avoided any reference to a consultation, to a reform of the Spanish constitution or even to a new financial arrangement for Catalonia (a possibility that had previously been aired by various PP spokepersons). Instead, even while saying that “dialogue has no use-by date when the general interest of the Spanish, and therefore, of all Catalans, is at stake”, Rajoy stated that “together we all win and apart we all lose” and that “the best service we can make to the democratic legitimacy that you [Mas] mention is precisely to respect the legal framework on which governments are based”. However, Rajoy’s choice not to explicitly repeat the standard PP line that a Catalan consultation would be “illegal” reflects recognition of the seriousness of the Catalan national challenge and the need to avoid further provocations that would strengthen it. In formally ruling nothing out and inviting the Catalan government to continuing discussion, the Spanish prime minister is playing for time, trying to slow further consolidation of Catalan independence forces and giving himself room to manoeuvre with its contradictions. For his part, Alfredo Pérez Rubalcaba, leader of the social-democratic Spanish Socialist Workers Party (PSOE), the main opposition party in the national parliament, reacted to Via Catalana with a call for Rajoy to face up to the reality of enormous Catalan discontent with the Spanish state, and to save the marriage by reworking the Spanish constitution along federal lines. In July, under pressure from its Catalan sister party, the Party of Socialists of Catalonia (PSC), the PSOE adopted a vaguely federalist proposal for restructuring government in Spain. Yet, given the PP’s absolute majority in the national parliament, it is very difficult to imagine the conditions in which it would feel the need to back the PSOE’s proposal. Indeed, the PP’s instincts and actions have been to use the present economic crisis to recentralise the notionally federal structure of the Spanish state by shifting many powers of the “autonomous communities” (states) back to Madrid. The main weapon in the PP government’s hand is to lay down draconian budget deficit reduction targets for the autonomous communities, also in the hope that popular blame for the resulting cuts in health, education and other services can be shifted onto the backs of local administrations. At the time of writing only five days have passed since this year’s Diada. Yet it is clear that the Via Catalana is already having an even greater impact on politics in Catalonia and the Spanish state than the 2012 Diada, which was also organised by the Catalan National Assembly and saw up to 2 million demonstrate in Barcelona. This is in part due to the extraordinarily dramatic visual impact of a 400-kilometre chain of human beings of all ages and conditions, dressed in Catalonia’s colours of yellow and red and also decked out in the red, yellow and white-starred blue triangle of the estelada (the flag of Catalan independence). This scene ran without break along the course of the ancient Roman Via Augusta—from inside the French side of the border in the north to inside the Valencian side of the border in the south. Along the route the road was painted with independence slogans and quotes from Catalan writers, big enough to be seen and televised from the air. Esteladas were also traced out in adjacent beaches and fields, and more than one farmer draped his cows and donkeys in independence paraphernalia. To organise the Via Catalana, the Catalan National Assembly (ANC) had calculated that it would take at least one person per metre to cover the 400 kilometres: a total of 400,000 who would have to commit to turn up at one of the 778 stretches into which the chain was divided. By mid-August the ANC could count on only 300,000 enrolled participants, and its planning map showed problems in the more scarcely populated regions, particularly in the south around the Ebro River delta. Yet when, at 1714 hours on September 11, the cathedral bells of Lleida rang out to announce the launch of the chain, the question was not too few participants but “too many”. To fill in the holes in the south 30,000 participants walked, cycled or drove down from Lleida (the one regional capital not on the route). For many stretches the chain was doubled, tripled or quadrupled, even in the countryside. In major cities it turned into a mass demonstration, with half a million filling central Barcelona alone. Within the Catalan capital, the Via Catalana divided into a coastal and city-centre branch in order to pass by famous sights like the Sagrada Familia cathedral, architect Gaudi’s La Pedrera and Camp Nou, Barcelona football club’s stadium. A separate loop (“Surround the Caixa!”) demanding a combined struggle for national and social rights—including against public sector cuts imposed by the Mas government— attracted 6000 to a double-line encircling of the headquarters of La Caixa, Catalonia’s biggest bank. Three thousand volunteers from Catalonia North (the part of southern France ceded in 1659) turned up at the border and extended the chain 3 kilometres into French territory. In the south, once the Valencian Supreme Court overturned a national civil guard attempt to stop the chain at the Catalonia-Valencia border, famous Catalan singer-songwriter Lluis Llach joined hands across the frontier with Valencian composer, Carles Santos. All along the chain, the classics of Catalan popular culture—“human castles”, “giant puppets” and "sardanes” (the national dance)—were in full swing. Thousands of families also turned the chain into an excuse for a good-humoured picnic. Volunteers who had come to the south were sustained with paella served up in massive improvised outdoor restaurants. Many migrant communities took part, not only from Latin America, but also from sub-Saharan Africa, Pakistan and India (picture below). Support also came from other nationalities in the Spanish state. In Barcelona, the Basque national flag, the ikurrina, seemed to be everywhere. How did the chain do where it had to pass through supposedly “foreign territory”—such as the working-class Barcelona suburbs formed by families migrated from other regions of Spain like Andalucia and heart of the anti-dictatorship struggles of the 1970s? The Spanish-unionist opposition within Catalonia had a day to forget. The local PP, having decided for the first time ever to boycott the official wreath-laying ceremony at the statue of Rafael Casanova (leader of the 1714 resistance), held its own rally of 500. The other unionist force, Citizens, attracted a handful to four sad balloon-releasing ceremonies. The only other appearance of Spanish centralism took the form of an aircraft-towed sign hired by the rabid-right media group Intereconomia. The sign, “Stronger Together”, flew the route of the Via Catalana to catcalls, boos, rude gestures and incredulous laughter. The movement for Catalan independence is the biggest social movement in Europe. Via Catalana mobilised 30,000 volunteers (the biggest effort since the 1992 Barcelona Olympics), had a Facebook page of 150,000 likes and used 800 photographers to record every metre of the chain. And, just as after the 2012 Diada, it left many political forces struggling to catch up. Marfany’s comment, which was directed against a “Catalan right-to-decide” interpretation of Via Catalana made by an Initiative for Catalonia-Greens (ICV) Barcelona city councilor, was nuanced but not disowned by other Catalan National Assembly spokespeople. The incident left many left and progressive supporters of a Catalan right to decide wondering whether to take part. Because they include members with different approaches to the Catalan national question, CiU and the PSC, as well as ICV and its electoral partner the United and Alternative Left (EUiA), all battled to work out their orientation to Via Catalana. More difficulty—it would emerge after the event—than many of their supporters, who generally regarded taking part in the chain as a way of asserting Catalonia’s national and social rights against “Madrid”. On September 11, Josep Duran i Lleida, MP in the Spanish parliament and leader of Union, the confederalist and Christian Democrat leg of the CiU coalition, turned up for the morning wreath-laying ceremony, but then flew out to Panamá before the Via Catalana began. Yet other Union MPs, including ministers in the Catalan government, took part. In the PSC matters became rather comic after it was decided that members could take part in a personal capacity. Leader Pere Navarro decided not to participate, but his father did, along with a number of PSC MPs, mayors and councilors. Within the EUiA, which supported both Via Catalana and “Surround La Caixa”, the PSUC Lives (PSUC viu), the Catalan affiliate of the Spanish Communist Party, voted not to take part, even as the EUiA branch in the town of Rubí took responsibility for helping organise that stretch of the chain. ICV allowed its members to make their own call while urging participation in “Surround the Caixa” and similar actions in other cities. ICV co-conveners Dolors Camats and Joan Herrera took part in “Surround La Caixa” while other ICV-EUiA MPs, like EUiA national convener Joan Josep Nuet and Jaume Bosch, an ICV MP in the Catalan parliament with long experience of the Catalonia-Spain relationship, participated in Via Catalana. Unsurprisingly, the parties that had no problems with Via Catalana were the ERC and the left-nationalist Popular Unity Candidacies (CUP). The CUP was also a major participant in the left-independentist evening Barcelona rally for social and national rights (“Independence to change everything!”), which attracted 50,000 and also saw some EUiA participation. What now—for the Rajoy government? So where does the struggle for Catalonia’s national rights now stand? From the PP government, which cloaks its Spanish centralism in spurious legalism, a number of considerations are driving Rajoy’s delaying tactic in face of the still-rising Catalan movement. An important one is that the Catalan government is nervous about going ahead with any consultation that the Spanish Constitutional Tribunal would be likely to declare unconstitutional. Madrid knows that Mas, who is presently being guided by the five legal options laid out in a report from the Catalan government’s Institute of Autonomic Studies, has already rejected a Kosovo-style unilateral declaration of independence for this reason. A key part of CiU’s strategy is based on building support internationally—support likely to be weakened in the short term by an “illegal” referendum. Equally important for Madrid is that a “shock-and-awe” ideological terror campaign about how nightmarish life in an independent Catalonia would be still needs to be built in parallel with Rajoy’s “openness to dialogue”. 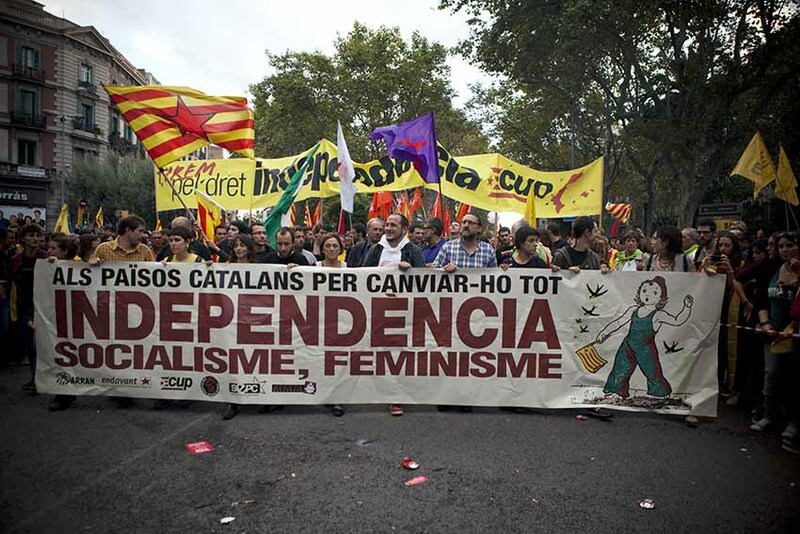 The outlines of this are already visible in the propaganda of the PP’s Catalan branch: an independent Catalonia would be outside Europe and the euro, economically isolated and depressed, unable to pay its pensioners and other social welfare recipients and with its university degrees unrecognised outside its borders. It would turn migrants from elsewhere in Spain into second-class citizens (“just like” the Russians in the Baltic states) and ban Castilian from public life, etc. etc. The PP receives valuable help in this slander from the most Spanish-centralist elements in the PSOE, such as Rodriguez Ibarra, former premier of Extremadura, who likes to compare Catalan nationalism to that of Hitler and Mussolini. Rajoy also calculates that a section of the support for independence (running at between 49% and 56% according to latest polls) is made up of “recent arrivals” blown in by the economic crisis. The more economic recovery proceeds, it is hoped, the more this group should desert the independence camp. Time is also needed for Madrid to get other European governments to assimilate the dangers an independent Catalonia would pose for them. Are they really ready for the impact that Catalan independence would have on other European “nations without a state”—like the Basques, Corsicans, Bretons and Occitans in France, the Sardinians in Italy, the Frisians in Holland, the Danes in Germany etc.? Once one of Europe’s borders— imposed by ancient and modern wars of conquest and arranged royal marriages—is corrected democratically, where will the process stop? An indication of what to expect in the field of Madrid’s relations with other European states came last week in the reaction of foreign minister Margallo to comments by the Latvian and Lithuanian prime ministers (the first conservative, the second social democrat) in favour of a Catalan right to self-determination. The ambassadors in Spain of both states have been summoned to “please explain” meetings in the Spanish foreign ministry. Of course, if Catalonia goes ahead with a consultation, the Spanish Constitutional Tribunal—headed by a chief justice who scored the job by hiding his PP membership and who once wrote that “any political event in Catalonia involves acts of onanism [masturbation]”—can be relied upon to declare it unconstitutional. But it will take time to prepare the conditions in which such a decision could be made politically acceptable. Finally, if the political balance of forces were to become so bad for Rajoy that accepting a consultation became his least evil course, he would need time to counter the enormous reaction from the PP’s most anti-Catalanist wing (led by former PM José María Aznar) and from ferociously anti-Catalan Madrid media and from other “patriotic” Spanish forces, like the Union for Progress and Democracy (UPyD)—all presently on an eagle-eyed watch for any sign of weakness towards the “seditious” Catalan government (term used in a recent editorial in the ABC newspaper). That kind of context would also see a strengthening of the fascist wing of Spanish centralism, one of whose groups interrupted a Catalan government ceremony in Madrid on the Diada, shoving the attendees around, trashing the hall and spraying tear gas. That could well be a sign of things to come as the far-right groupuscules sniff the chance to grow in a hysterically anti-Catalan atmosphere. Here one furphy should be laid to rest—if the Rajoy government wanted to allow a constitutionally impeccable consultation in Catalonia, it could (along any of the lines laid out in the Institute of Autonomic Studies’s options paper). A report in the magazine Tiempo on behind-the-scenes negotiations between Catalan and central government teams that followed on a private August meeting between Mas and Rajoy shows that Madrid knows this to be the case. These talks apparently focused on whether a form of question might be possible that would allow the Rajoy government to support a consultation. Tiempo reported that the bottom line for Madrid would be that the question be threefold—for independence, for the status quo, or for a new relation between Spain and Catalonia. Such a choice would give Spanish unionism its best chance of putting the Catalan independence vote into a minority. It is unlikely that events Catalonia will follow the scenario laid out by PP war planners. The reasons are either that sections of the national Spanish establishment still believe their own propaganda that all they’re dealing with is a “conspiracy” by corrupt Catalan politicians, or that Madrid still can’t work out what it really implies for politics, or that they are just running out of options given that an old favourite, outright repression, is out of the question for the time being. The “1934 option”—to declare the Catalan government illegal, arrest it and impose direct rule from Madrid--is ruled out for now. It would require the national government to manouevre the Catalan government into committing acts that had at least some chance of being portrayed to “world opinion” as “illegal”. The social reality in Catalonia is that Via Catalana is the latest and most dramatic expression not only of a rising independence sentiment (as registered in the polls), but of an increasingly organised and powerful social movement expressing disaffection with the traditional ways of doing politics, including by those traditional parties like CiU that share (or say they share) the same independence positions as the movement. Two important expressions of this trend were the 2010 local consultations for independence, in which 554 of the country’s 947 municipalities participated, the rise of the indignado (15-M) movement, as well as the 2011 formation of the Catalan National Assembly and the Association of Municipalities for Independence (AMI). A further reflection was the entrance of the CUP into the Catalan parliament (with three seats) in the November 2012 election. The composition of this parliament already lags behind the rise in independence and “right-to-decide” opinion. The latest polls show that if an election were held today the ERC would overtake CiU as the largest party and one poll also shows the CUP doubling its parliamentary presence. In all polls ICV-EUiA would increase or hold its vote while the PSC—once the second party in Catalonia but supportive only of a “legal” consultation—would lose even more ground. After the Via Catalana this trend can only have got stronger. On the day the mood along the chain was that an end to Catalonia’s 300 years of humiliations was finally in site—independence was appearing on the political horizon. In contrast to the 2012 Diada, the estelada, and not the senyera, the official Catalan flag, completely dominated along the chain. This reality explains the September 15 reaction of the Catalan government to Rajoy’s reply to Mas—diplomatic acceptance of the offer of dialogue but with no intention of being drawn into “unnecessary delays in the process”. Spokesperson Francesc Homs also called on Rajoy to follow the example of Britain’s PM David Cameron in his dealings with the Scottish government and show himself serious about negotiating a referendum. Finally, how certain is it that a referendum would produce a majority for independence? As matters stand, with polls showing the pro-independence vote straddling the 50% mark, it’s not predetermined. All the factors mentioned in this article could still play a role in creating a political atmosphere that could tip the vote either way. This is one reason why, according to various newspaper reports on preliminary negotiations among the parties supporting a consultation, its seems likely that the word “independence” will not figure in the referendum question, but rather the formulation “state of our own”. In a yes-or-no referendum, this would maximise the chance of federalist and confederalist forces joining with independence supporters in supporting a yes vote. The final form of a sovereign Catalan state’s relation to other states and peoples in Spain and Europe could then be worked out in a political context that seems bound, after the 2014 European elections and the 2015 Spanish national poll, to.be very different from todays. The main prelude to Barcelona’s fall was the withdrawal of defending British troops following peace deals reached by Britain, Austria and the Dutch Republic with France and Spain at Treaty of Utrecht (1713). The core of this treaty’s re-carving of Europe was renunciation by the French and Spanish monarchies of all rights to inherit each other’s thrones, thus satisfying the main British war aim of ensuring neither power got too strong in Europe. The price of Spanish agreement was for Britain and Austria to stop defending Catalonia, which was also effectively handed to Madrid on a plate as compensation for Spain’s loss of possessions in Europe and Latin America. The Treaty of the Pyrenees was signed between Philip IV of Castile and Aragon and Louis XIV of France and put an end to the Thirty Years War. One of its results was the ceding to France of the Catalan territories of Roussellon and Cerdanya. Philip IV negotiated the treaty without consulting the Catalan authorities or the affected population. In fact the treaty was kept an official secret until 1702. The territories involved conspired for years to be returned to Catalonia and the Catalan authorities also refused to accept the partition. The region’s integration into France only became really effective in 1720, after Catalonia’s own integration into the Spanish state. On October 6, 1934, in reaction to the nomination of three ministers from the far-right Spanish Confederation of the Autonomous Right (CEDA) to the Spanish national government, the Catalan government of Lluis Companys (ERC) declared the “Catalan State within the Spanish Republic”. This “Catalan State” lasted only 10 hours, ending in the arrest of the government and the chiefs of the Catalan police and their imprisonment on a ship. They were only released in February 1936, after the victory of the left in the Spanish national elections of January. See http://links.org.au/node/3028 for a summary of the most recent phase of these. The latest outrage is the decision of the government of the Balearic Islands to reduce Catalan, the language of the islands, to equal status with Castilian and English in the archipelago’s schools. At the time of writing all high schools, public and private, on the islands are on indefinite strike in protest.